BE WARNED: This one is a whopping 110 IBUs! The marketing folks at Stone did a great job with that video. If you can watch that and not be curious about what it tastes like, then you are a better person than I. For me, I couldn’t wait to get my hands on this one. The release date was June 11, 2012, which was just one day after my birthday, 2 days after the Firestone Walker Invitational Beer Fest, and unfortunately, 5 days after my surgery, so I still wasn’t allowed to drink. So expectations were pretty high for this one. I had a sober birthday, I couldn’t attend a beer fest I’d been looking forward to for months, and now this. It pours a rich golden color with a healthy head up top. The nose is predominately citrus, with grapefruit notes right up front. The first sip is incredibly bitter. Even with the warning on the bottle, I was still surprised, pleasantly surprised. If you are a hop-head then this should be on your shopping list. The beer is balanced with extra malt to compliment the abundance of hops and the result is an extremely well-crafted beer. 5 beer caps from me on this one. While I’d like to think that beers like this haven’t ruined my palate, I do admit that they have ruined my ability to enjoy a weak, thin, fizzy, yellow brew. Gone are the days where a Bud Light sounded refreshing. 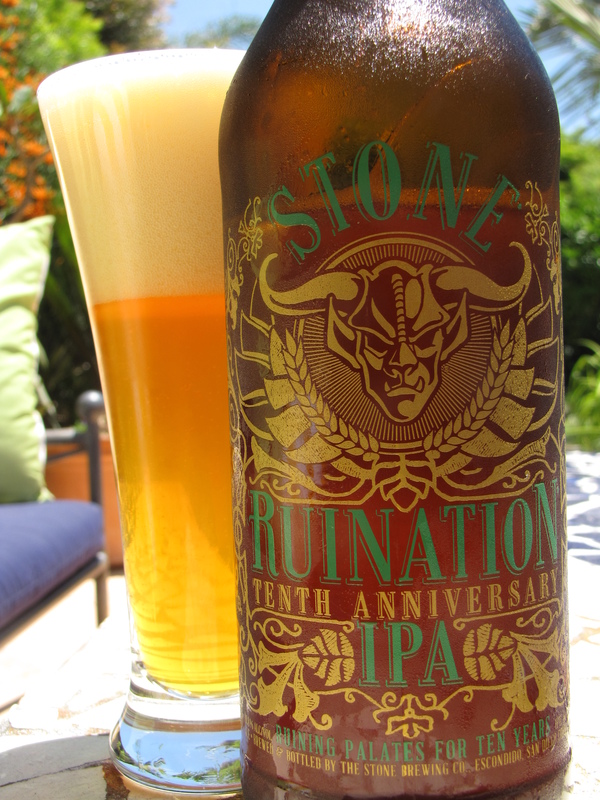 This entry was posted in IPA and tagged 10th, Anniversary, review, Ruination, Stone Brewing, Tenth by Erik. Bookmark the permalink.